Inflammatory bowel disease (IBD) brings to mind a condition that affects the digestive tract, but Crohn's disease and ulcerative colitis can also affect many other parts of the body. IBD is also associated with complications outside the intestines, which are sometimes called extra-intestinal manifestations. Some of the more common extra-intestinal manifestations are skin conditions, some forms of arthritis, and eye conditions. An eye disease is not the first complication you may think of when it comes to IBD. But in fact, there are several eye conditions that are more common in people who are diagnosed with IBD. In some cases, the diagnosis of IBD might come after a problem with the eyes is diagnosed. One eye disease that's associated with IBD is episcleritis. Episcleritis is an uncommon eye condition associated with IBD that will typically resolve on its own and thankfully does not lead to loss of vision. However, it can cause the eyes to be red and irritated, which can be troublesome and affect a person's quality of life. Episcleritis is inflammation in the episclera of the eye. The episclera is the tissue that lies over the sclera (the white of the eye). Symptoms typically begin suddenly and may be in one eye or both eyes. Most cases (about 70 percent) of episcleritis occur in women, and the condition is more common in young and middle-aged people. 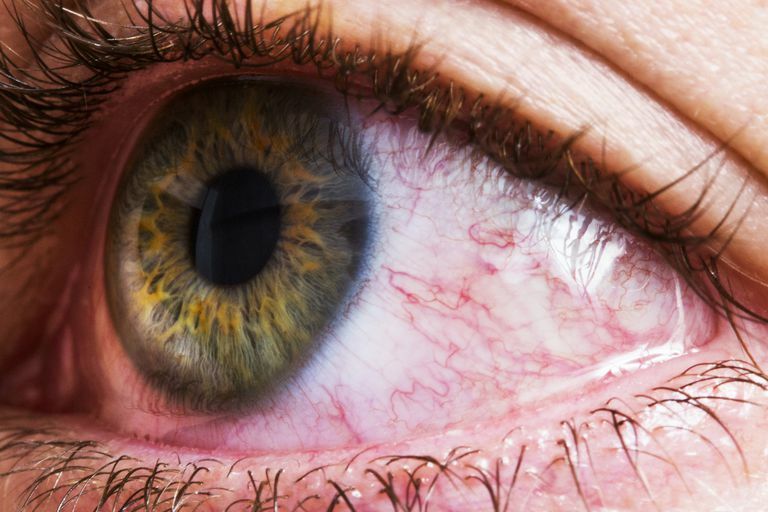 Anywhere from 2 to 5 percent of people with IBD will develop episcleritis. Typically the episcleritis will resolve when the underlying IBD is under control. In most cases, episcleritis is a self limiting condition and will resolve on its own without any treatment. Treatment is often given to help lessen discomfort from symptoms. Artificial tears may be helpful, and they can be used until the episcleritis resolves. For those who are experiencing more pain or discomfort, eye drops containing a non-steroidal anti-inflammatory (NSAID) may be used for a few weeks. If topical measures do not provide any relief, an oral NSAID may be prescribed to help with symptoms. In cases where there are nodules, an oral steroid might be used, but this is very rare. For episcleritis associated with autoimmune conditions such as IBD, treatment is with a topical steroid. Topical steroids increase the risk for other eye conditions such as infection, cataracts and glaucoma so their use should be as brief as possible. Treating the underlying autoimmune condition is also recommended. It can sometimes be the case that people who don't have any other autoimmune or immune-mediated conditions will develop episcleritis. If that's the case, there might be a reason to contact an internal medicine doctor and see if there's enough evidence to test for an underlying problem that's associated with the episcleritis. For people with IBD, it's known that these two conditions can go together. Seeing an eye doctor on a regular basis and taking care of the eyes to avoid any infection or injury is important in people with IBD. Petrelli EA, McKinley M, Troncale FJ. "Ocular manifestations of inflammatory bowel disease." Ann Ophthalmol Apr 1982; 14:356-360. Stone JH, Dana MR. "Episcleritis." UpToDate 6 Jan 2010. Vorvick L, Zieve D. "Episcleritis." A.D.A.M. 15 Jul 2008. Can Acne Drugs Like Accutane Cause IBD? Are Mouth Ulcers a Complication of IBD? Is Slippery Elm Effective For Crohn's Disease or Ulcerative Colitis? What Are the Differences Between These 6 Biologics for IBD?